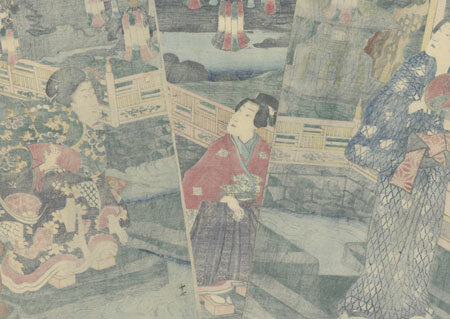 Comments - Charming scene of Prince Genji and two attendants walking across a stream on large square stone stepping stones. The stones lead from one side of a mansion to another, with a stone embankment along the water's edge zigzagging across the scene. 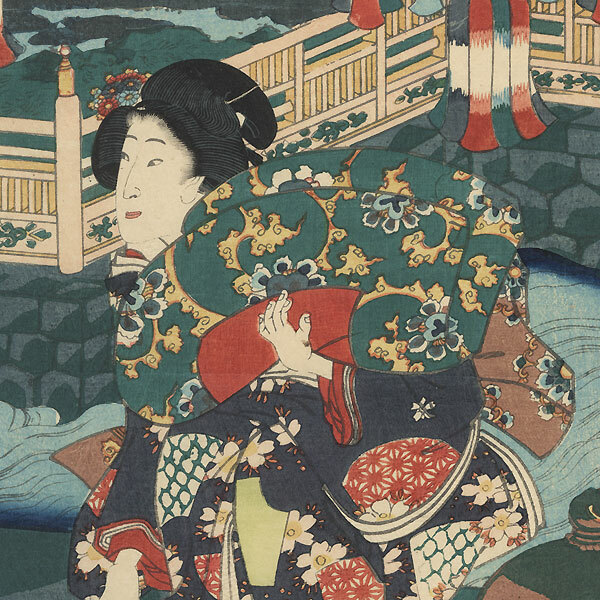 The nobleman stands at left with a rather petulant expression, wearing a summer kimono and holding a fan. His page crouches on a stone in the center, holding his sword upright and looking expectantly at the beauty who follows carrying a cushion against her shoulder. Glass lanterns decorated with tassels hang over head against the night sky. An interesting composition that's seldom seen. Condition - This print with excellent color and detail as shown. Three separate panels. A couples small holes, repaired. Slight soiling and a few creases at edges, a few marks. Please see photos for details. Good overall.